Vegan Eats and Treats! 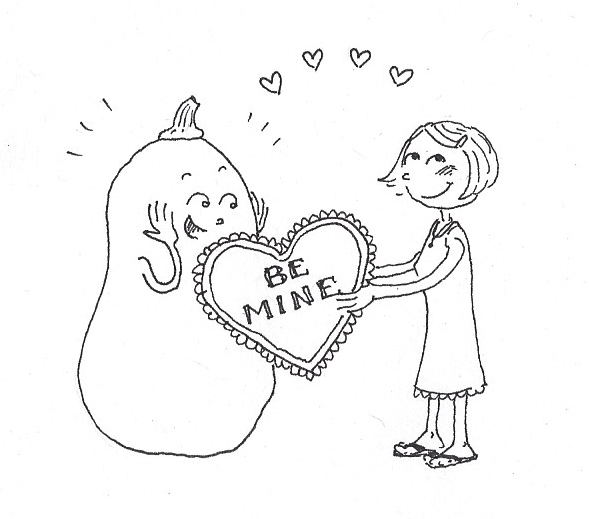 : Be Mine, HoneyNut! Last year a new farm stand showed up at our Saturday farmer's market, and they have the most amazing produce. They've got a huge variety of peppers (even in winter! ), loads of greens, tomatoes (in February! ), and so much more. It's all organic, and it's all beautiful, and the people who work at the stand are really friendly. They've recommended a lot of good picks to me. you can't really tell, but they are little. 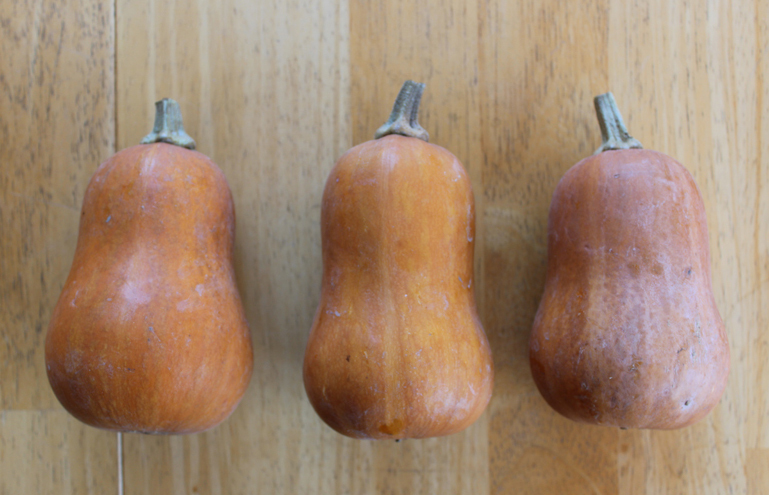 The squashes are called Honeynut Squash, and they look like mini-sized dark-skinned Butternuts. The man advised me that these would be too sweet for soup or stew, but that they are amazing roasted. I am not a dumb-dumb, so I bought one to see for myself. Needless to say, the next week I bought three of them. I won't lie. These little buggers are no fun to peel! The peel is a bit tough, and I've tried using my Y-shaped peeler and a paring knife. Either way, it takes a while and is slightly annoying. But, then again, don't all meaningful relationships take a little work? I think of it as the little Honeynut just playing hard to get. As you can see, even when they are still raw, the inside of the squash is a dark, rich orange color. Let me tell you - that intense color is indicative of some seriously intense flavor! But look at this!! Can you believe that beautiful dark orange color? I roasted these little pieces at 400F for 40 minutes, with just a little spray of olive oil, and a dash of salt and pepper. They lasted less than 10 minutes before Mr VE&T and I had completely devoured them. Mr. VE&T graciously offered to help me eat my portion, but I declined. Nice try, buddy. Oh Honeynut, I love you. So far, I've only seen these at that one farmer's stand, so you might not have the easiest time tracking down a Honeynut Valentine of your own. But, if you do spot one, don't hesitate! Set the date, and don't be late! Poor delicata is going to have its little heart broken! Don't worry. 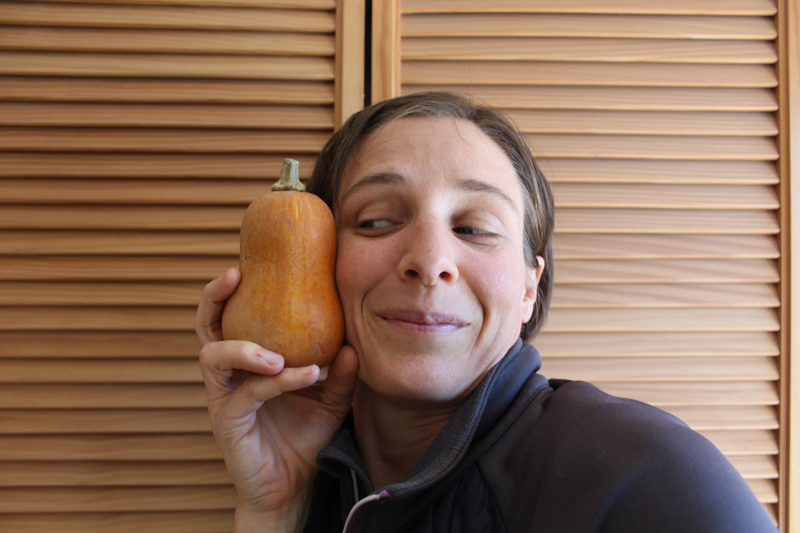 Your secret is safe with me… That Honeynut squash is adorable, and I love the last picture for a size comparison with your sweet face. I've never seen that squash locally, but I'm going to keep my eyes open for it! I hope you can find one. Maybe I could send you some! :) (is that allowed?) They are really delicious. Today I bought 4 of them! Sounds yummy! Which farmer's market stand had these beauties? I don't know if it's true of this type of squash but I never peel squash when I am roasting. I usually find I can eat the skin. Connie! I should have included the details for the SC locals! I don't know the name of the farm stand (I looked this morning and they didn't have a sign up yet) - but it's at the Saturday Cabrillo market. The farm stand is in the middle level - way down at the end closest to the building, on the left. They have amazing produce! Today I got 4 honeynuts, portuguese kale, yellow bell peppers, and I think something else too. So good. I'll look for them the next time I make it to the Cabrillo market. Oh, I haven't seen these, but will keep an eye out. Of course, even though Washington is not that far from California, in terms of produce it might as well be a continent away ! I wish we got all the exciting varieties of produce here that you get in the US! They sound very yummy. According to my housemate, you can eat the stems of any kale! I walked into the kitchen to find her crunching away on the raw storks!